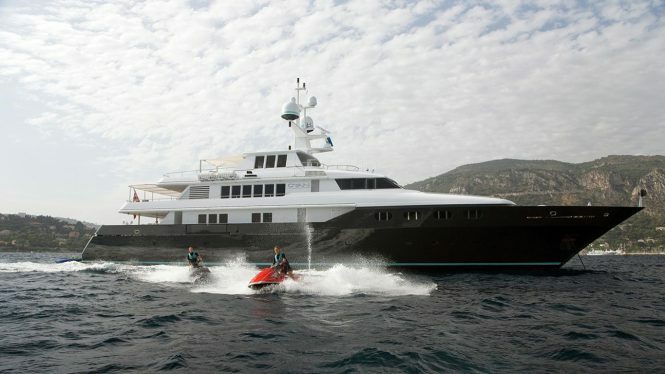 There’s still the opportunity to charter in the Caribbean and Bahamas before the winter charter season comes to an end, and 50m/160ft superyacht CYAN (ex.RENALO) is timelessly styled and suited to corporate events and parties – and she’s even better with a 20% discount. 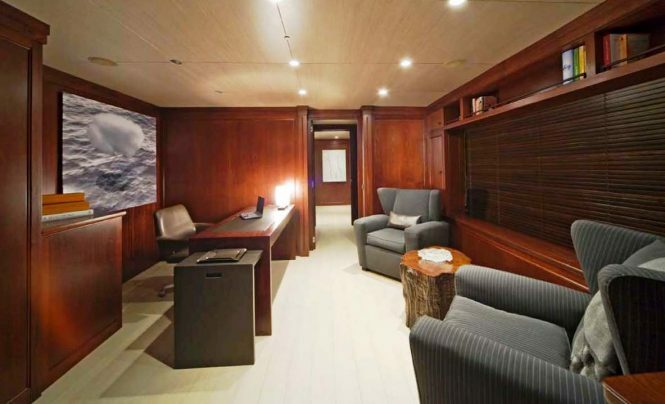 Built by Codecasa in 1997 and refitted in 2017 with new furnishings and state-of-the-art technology, luxury yacht CYAN has naval architecture and exterior styling completed by Codecasa while her interiors are the work of Nina Seirafi Design. 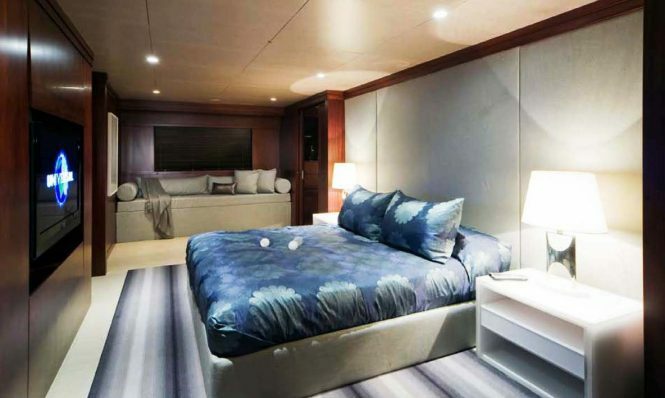 The main deck is home to the forward Master suite, which has its own private lounge and spacious en-suite facilities. Behind the foyer, the dark wooden panelling creates a stately and intimate environment for a meal at the forward formal dining table, which seats 10 guests. After an indulgent meal from your expert chef, unwind on the plush lounge sofas and continue the dinnertime conversation or watch a family film together before bed. The main deck aft provides an alternative venue for your meal and seats eight guests in a sheltered environment with excellent views of such destinations at the Pitons of St. Lucia. Whether looking for a tranquil environment for personal time during the day or for hosting parties the run long into the early hours, the bridge deck has a beautiful large skylounge to suit your purposes. 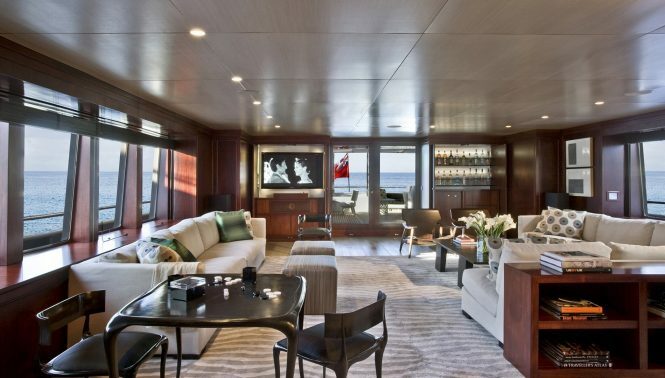 A grand piano and a games table add to the entertainment as the group settles into the L-shaped sofa or heads out onto the aft to watch the sunset from the stern. 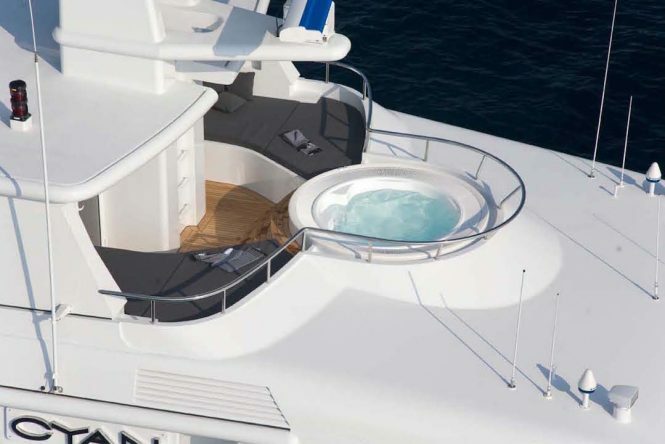 Above, the sundeck aft has a large sunpad and the area becomes an outdoor cinema at night. 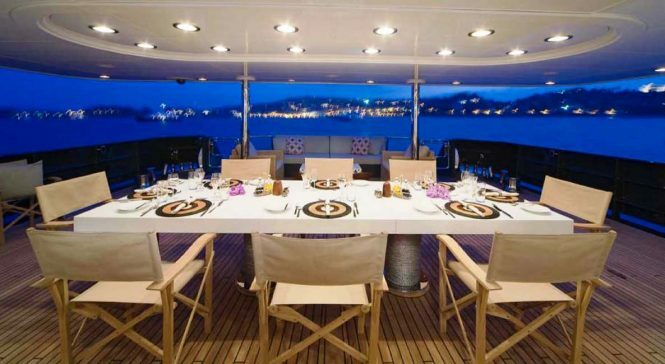 The foredeck offers a quiet space where guests can lie on the sunpads and watch the changing scenery, or spend an hour or two soaking in the Jacuzzi while trying out cocktails containing some of the region’s famous rums. While in transit, the on board sundeck gym will keep guests fit and active and there is a massage table to ease tired muscles before bed time. 12 guests will be accommodated in 6 exceptional air-conditioned cabins: 1 Master suite, 1 VIP stateroom, 2 double cabins and 2 twin cabins with 2 Pullman berths. 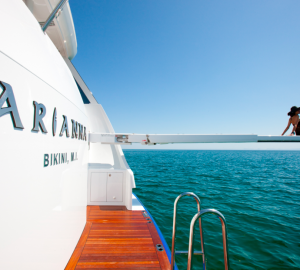 The professional crew of 10 will ensure that every guest has a safe and relaxing journey throughout their charter. 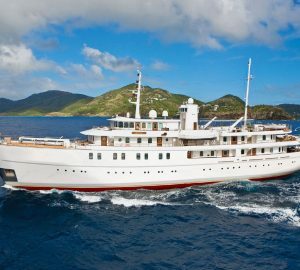 Charter motor yacht CYAN in the Caribbean from $196,000 USD per week plus expenses, or take advantage of her current 20% discount off week-long charters running until the end of March. 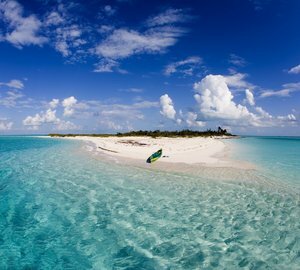 CYAN’s availability & more information. 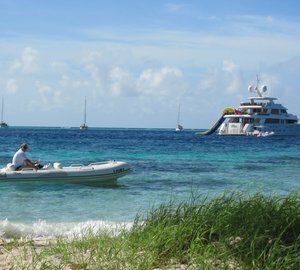 Please contact CharterWorld - the luxury yacht charter specialist - for more on superyacht news item "Special offer: 20% off charters aboard M/Y Cyan in the Caribbean ".